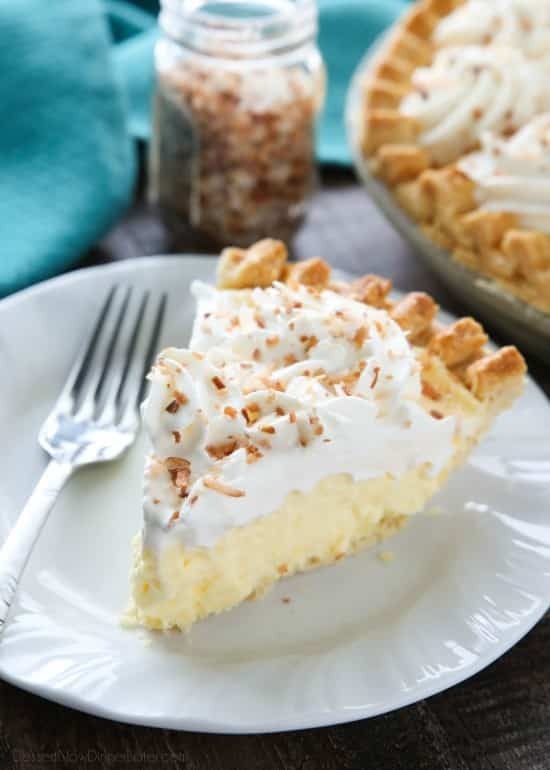 Easy Coconut Cream Pie - Dessert Now, Dinner Later! 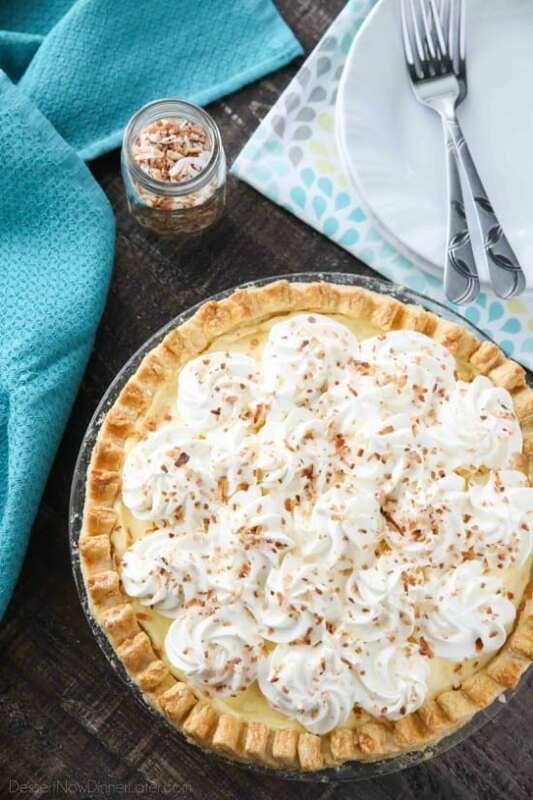 This Easy Coconut Cream Pie is light, delicious, and simple using instant coconut pudding, whipped cream, and toasted coconut. 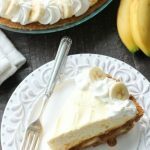 I’m on a pie kick in preparation for Pi Day (3.14) and this Easy Coconut Cream Pie is super simple to make. You can even cheat and use a frozen store-bought crust. 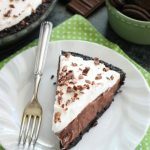 The thing I love about this pie is that the texture is light, so you don’t feel like you are eating a heavy dessert after a big meal. We would make Coconut Cream Pie almost exactly like this at a bakery I used to work in. 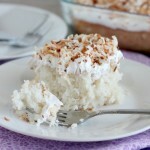 Pudding, whipped cream, and toasted coconut. We didn’t have coconut flavored pudding in the bakery, but we would use coconut extract with the toasted coconut in a vanilla pudding. Luckily Jell-O brand has an Instant Coconut Cream Pudding Mix which makes this coconut cream pie super easy to make. All the more reason to whip it up and serve to your family (or friends). I like to mix some whipped cream in with my coconut pudding to make it a little lighter, but not too much that it won’t set up. Of course you top the pie with extra whipped cream and toasted coconut for good measure. I hope you like it as much as I do! Toast coconut. OVEN METHOD: Place coconut flakes onto an un-greased baking sheet. Toast at 350 degrees Fahrenheit for 2 minutes. Stir. Toast 1 minute. Stir. Toast 45 seconds and take it out of the oven. Each oven is different so toasting time may vary. PLEASE keep an eye on the oven the WHOLE TIME! Coconut toasts quickly once it starts to brown. Stir it frequently as it toasts. STOVETOP METHOD: Place coconut flakes into a large sauté pan over medium heat. Stir constantly until desired color/level of toasting. Remove from heat and immediately empty into a heat safe bowl to cool. In a large bowl, whisk pudding mix with milk until dissolved completely. In the bowl of a stand mixer with the whisk attachment, whip the heavy cream, powdered sugar, and coconut extract (if desired) until stiff peaks are formed. The cream will have ripples in it as it's whisking when it's ready. Fold in 1/3 of the whipped cream into the pudding and mix until all the streaks are gone. Spread the filling into the cooled pie crust. Top with remaining whipped cream. Cover lightly with plastic wrap and refrigerate for 1-2 hours (+). Remove the pie from the fridge. Sprinkle toasted coconut on top just before serving to ensure a crisp texture. Slice and serve. Enjoy! *You may be able to serve this pie immediately if you keep the filling as cold as possible while preparing. *Originally published 11/18/13. Post and photos updated 3/7/18. 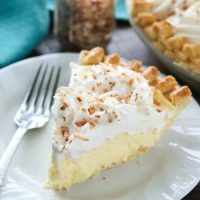 Coconut cream pie is one of my favorites, but I rarely make it. Seeing this pie makes me want to run to the store and pick up some coconut! 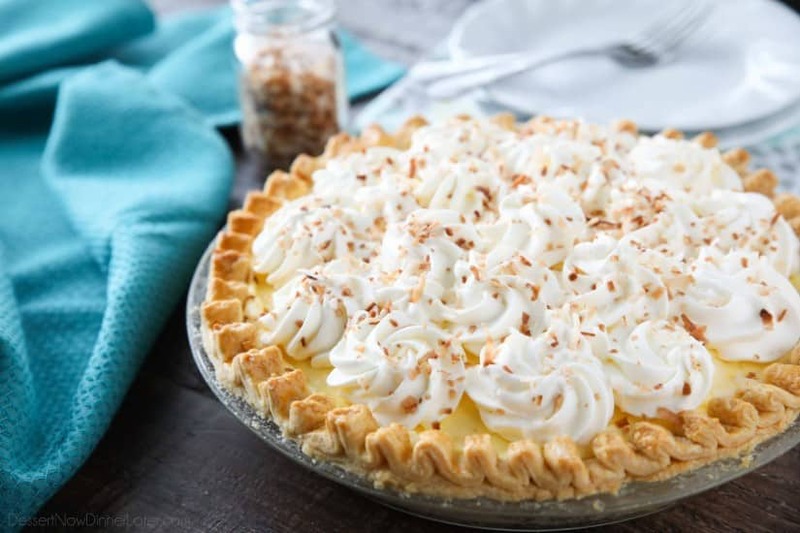 my sister is a server at a very upscale restaurant and they serve a delicious coconut cream pie.the woman who makes the pie charges the restaurant 25.00 dollars a pie.well i said to myself i know that this pie is made with pudding so i stated looking for a recipe and i found yours which i am convinced is this exact pie.i’m so happy.going to make one right now.Thank you! Hi Joan! That’s crazy! I hope this pie compares well to the pie served at the restaurant. You’ll have to let me know! TOO DIE FOR. I used the cooked coconut pie filling, coconut milk, and coconut extract I didn’t have enough whipped cream so after whipping the cream with coconut extract I added 1 cup cool whip. Used this for mixing in the filling and topping. Great substitutions! I’m so glad you liked it Sharron! 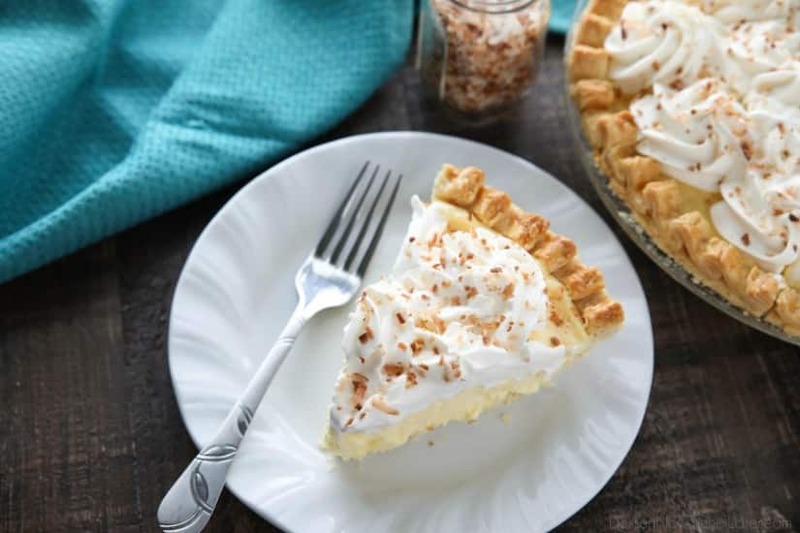 Your pie would be fabulous with a coconut pie crust. 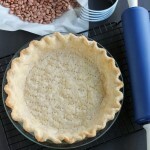 Here’s a good one to try – Coconut pie crust gluten free AND grain free https://www.frugalfarmwife.com/article/coconut-pie-crust-gluten-free-grain-free/. When I was the Pastry Chef at our Ramada Inn I used this pie crust recipe for coconut cream pies. Wow! I’ve never had a coconut pie crust. Thanks for the suggestion!